Welcome back to my series on making your own delicious Thanksgiving Dinner, even if you’ve never done it before. If you’re just joining us, you may want to check the earlier posts on Getting Organized, The Checklist, Tools and Decorations, The Gravy Tutorial, How to Cook the Turkey, and How to Make Soup. These were written with the idea that you’d be making and doing some of this stuff in the weeks approaching Thanksgiving and I know we’re getting down to the wire here, but you can still get organized and get it all together, even at the last second. Today, a quick primer on how to make Mashed Potatoes. I know. You’re thinking seriously? How to make mashed potatoes? Isn’t that, like, the easiest dish to make? Yeah. It is, but it’s also a critical one and you can turn those lovely spuds into a gluey mess if you’re not careful. However, this method is about as foolproof as it can get. Also, this is one of those dishes that you really have to make fresh. Which means while everyone is lingering over their salads, you’ll be in the kitchen finishing these up. First up, figure out which potatoes to buy and how many of them you need. Personally, I like russets (or Idahos) for mashing. Those are the longish ones with the scaly brown skins on them. My husband likes the smooth red-skinned ones. And there are those who insist that Yukon Golds (which should be specifically labelled as such) are the absolute best. Yukon Golds do make a darned good mashed potato, but a) you’re going to have to find them and b) they cost considerably more. If you really want to, go for a mix of red and russet, which is, essentially what a Yukon Gold is. As to how many? Imagine a man’s fist (or if you’re a man, make one). You want one potato roughly that size for each person (or two that together are about that size), plus a couple extra for the pot, as it were. Don’t stress on making too much. It’s really hard to because almost everyone loves mashed potatoes. Secondly, you can do all sorts of tasty things with the leftovers. The easy part is getting the potatoes prepped and cooked. We don’t peel the potatoes. You can, but it’s an extra step and you can’t peel them ahead of time because the insides turn an icky gray brown sitting in air. They’ll still taste all right, but they’ll look pretty nasty. About the time the soup is ready and you’re doing your final blast of heat on the turkey, you’ll want to cut up your potatoes into 2-inch chunks. Do not get a ruler out and measure. Just guess. Trust me, it will be fine. Make sure you get them into a pot and cover them with water, then cover the pot, and put it on the stove over high heat. 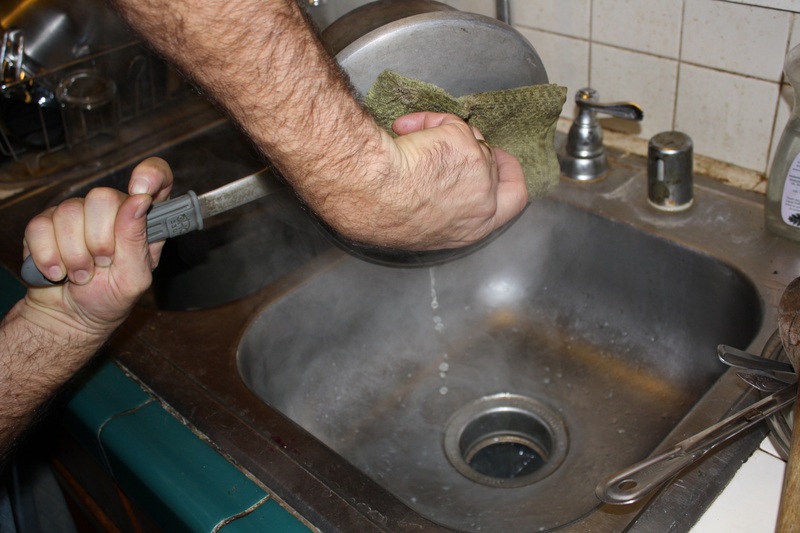 Keep an ear out – it will start boiling over, at which time, you go over to the stove and turn it down to medium heat and let it go for about another 20 minutes or so. You’ll probably be done with your soup (or whatever) around then. The turkey should be ready to come out of the oven to rest. Let the potatoes rest in the water, also. Now, for the mashing. Drain the potatoes by holding the lid open just enough for the water to get out, but not the potatoes and flip it over the sink. This obviously works better with a pot with a long handle than like a Dutch oven. If you had to resort to one of those, get someone to help you drain. Note – you’re not getting out an extra bowl or anything to mash in. Use the pot. 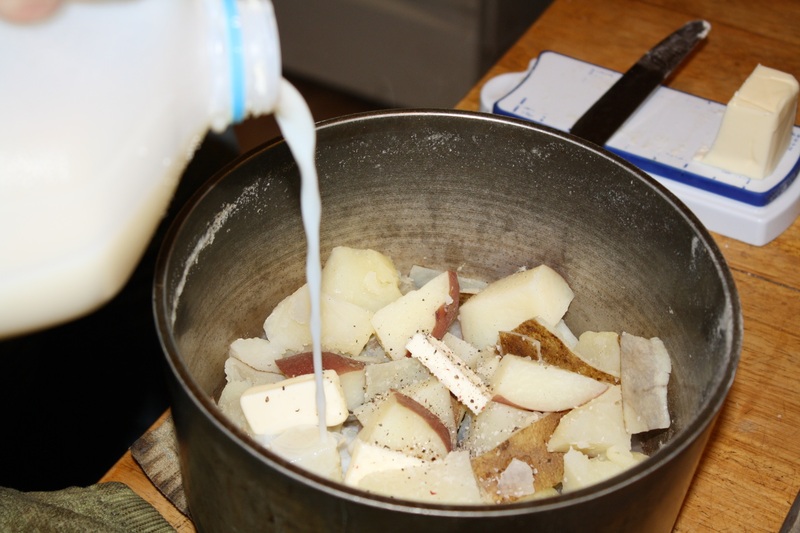 Now add a couple chunks of butter – about a tablespoon per five potatoes, but that’s just a rough guestimate. 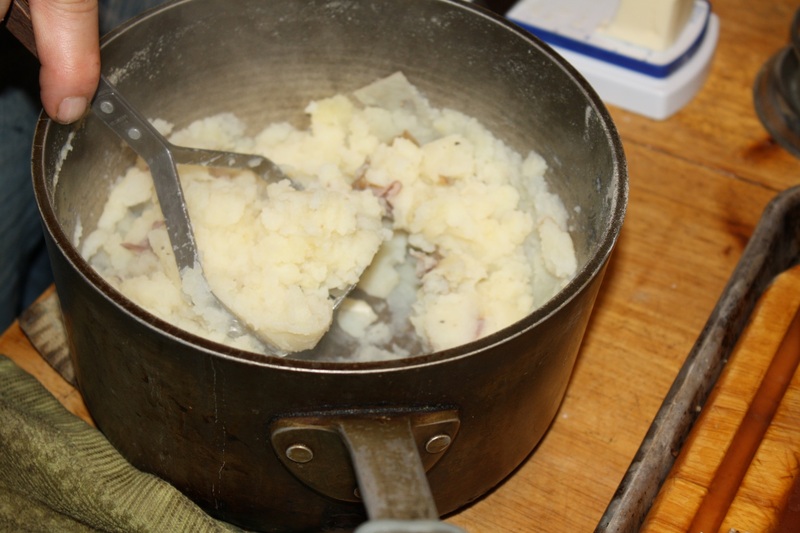 You can add up to half a stick (four tablespoons) and probably be fine even with a relatively small amount of potato. Start with a little, and some salt and pepper. You can always add more if the potatoes aren’t as creamy as you’d like. Same with the milk. Add a little and see what happens as you mash. You can always add more, you can’t add less. Now, if you’re used to precise proportions as laid out in a recipe, that can feel really uncomfortable. But the recipe is going to steer you wrong as often as not. The recipe writer has no idea what kind of potatoes you have, what conditions they were grown in, how hot or cool your kitchen is. You’ve just got to add a little at a time and see what happens. Now, for the mashing. Don’t use anything mechanical, even for a mountain of potatoes. Use a hand masher. It won’t take long to do by hand and you won’t end up with glue – a real risk when you’re using a hand mixer or immersion blender. And that’s pretty much it. If you’ve got time, try a sample batch tonight or sometime the week before Thanksgiving. Because mashed potatoes are insanely tasty and relatively easy to pull off. Even without a recipe.